If you’ve stuck with me this far, you’re probably wondering how anything actually gets done. Don’t worry, we’re to that point! I would stress that if you’re really wondering how this works for me and what you can get from the process for yourself, you definitely should go back and read from the beginning. It will probably take you 10-15 minutes tops. 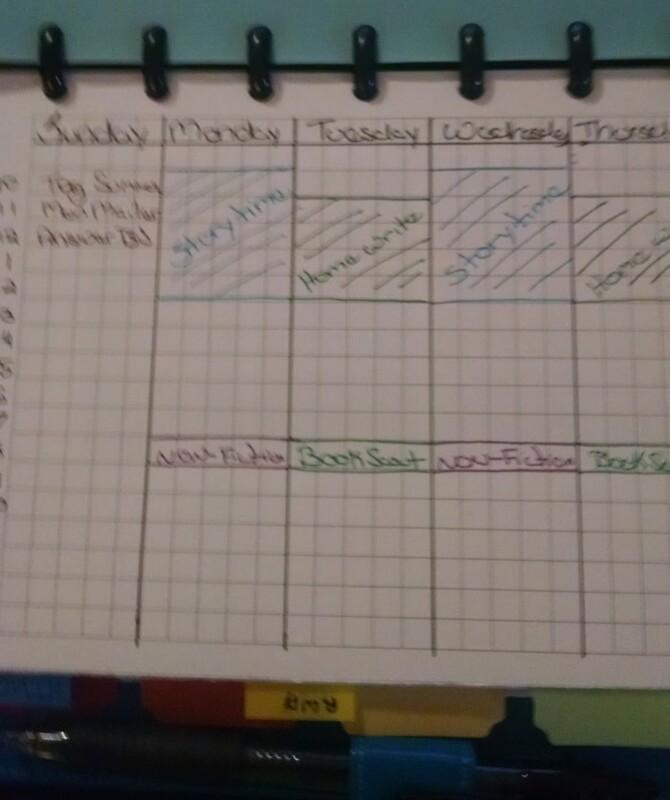 That said, I realized going into the Planner section that I was going to have to talk about the three different ways I use Planners to really make the most of this section. I’m keeping in mind that if you’re here you’re probably someone who works a day job or runs a household AND does a second thing like maybe run a book blog or write or edit or makes jewelry or something. My peeps seem to be driven, busy, creative folk. So let’s keep that in mind. One of the problems I heard a lot when training new managers, employees and interns on getting and staying organized is their process is great while they use it then something changes it doesn’t work any more. I think a lot of that is because companies (and trainers) say, “We’re going to use XYZ” then they to a great training that of course makes complete sense to everyone. But, two weeks into real life, it doesn’t work any more. That’s because it doesn’t work for you. With that said, I think the simpler the better. I don’t doodle or use stickers or do anything creative. I’m not a visual artist and that feels like work to me. If they work for you, rock on. But don’t feel like you need anything special to make a planner work for you. This is a high level view of how I do things. If any section has questions, it will be this one. Feel free to ask away! I’m going to take one of the big things right off the table: Calendars. I keep mine on my phone. If for some reason I need a month visually, I print it out. To me this is the simplest way. It sends me alerts, let me schedule on the go, more than one person can see it if need be, and it is printable. So, right there, that’s about 90% of planners out the door for ROI for me. I know time heavy people are thinking, what’s left? I’m a list-based planner person and have been for *mumbles* years. I know the Bullet Journal thing feels like a hot new movement bc a guy was smart enough to make a video and blog, but a lot of really productive, organized people have been using list-based planners since we just called them list-based planners. I’m going to start with my Everything But The Day Job Planner here. First off, I want to be able to add and remove pages. I want to shuffle things around to make the flow work better. I don’t want three ring binders (I hate those things). A few years back, Staples created the ARC and I fell in love. We won’t discuss how many I have. Staples has sales on them regularly. My EBTDJP ARC is the half-size. It fits in my tote and is just enough room for everything. You can see there’s set time for writing and marketing and there’s a lot of time left blank. I’m not just out hitting on hot heroes during the blank time. It was important to me not to over-schedule myself and take away the freedom to get what needs to be done that done finished. Setting writing time MINIMUM means that I’m distraction free for AT LEAST that amount of time each day to write. It’s often longer. But, the unscheduled time is for marketing, research, creative work, partnerships, responding to readers, etc. Why do I have this weekly schedule if I’m not beholden to anyone? Because I’m beholden to me and getting it done. This schedule says I’m committed and I’ve made time. The next page is a little bit of a lie. Yup, I lied to you. There is a calendar in my Planner. It’s a bird’s eye view calendar. 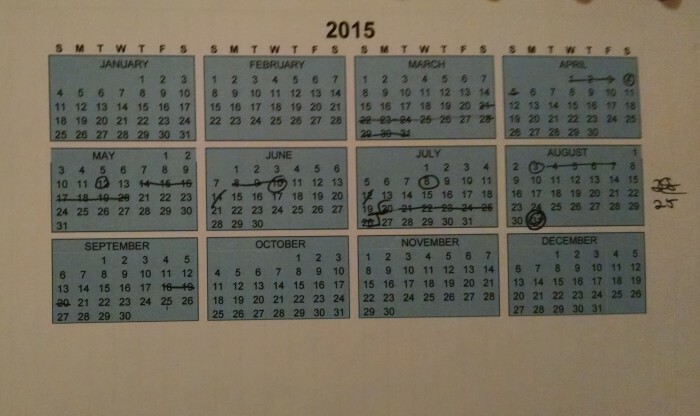 It’s the entire year with groups of days I’m not available to work crossed out. For example, I long since have stopped bringing my laptop to conferences. I’m not going to work. I’m going to socialize and then go rock in a corner alone in my room until I’ve regained enough introverted energy to go socialize again. No writing. So the second page is all about having the big view of my year for planning things on the fly. Ok, I’m sorry. That’s the last lie I’m going to tell you….today. After that I have my month page. It’s pretty straight forward. I usually have 3 months worth of pages going at a time so I can schedule out. 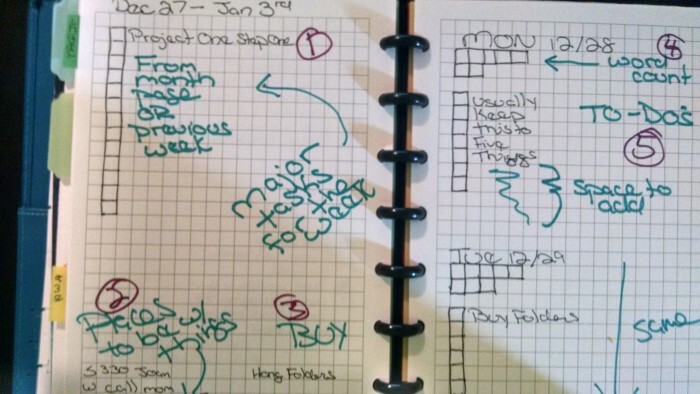 The point of a Planner is so your brain doesn’t have to work hard. Get the garbage out and on the page so you don’t have to worry about it. For example, the last two years at the last minute a reader has asked if I’m going to do signed copies for sale for Christmas. Every year I forget there’s interest in this. Every year I rush to try to get them for people. I’ve already made a tickler page for major things like that so it doesn’t happen again. My month page is just a month with boxes running down the side. Simple. I won’t make this even longer with a picture of that. Y’all are smart folk. After that is where I start to get into how things get done on a daily bases. Each week (starting on S unday) gets a page and then each day gets a page. Check out this nice pretty fake page I made for you guys to keep this simple! This is what my weekly page looks like. It typically goes for 3.5-4 pages. Letting me start a new page every time on the left hand side. I’m going to run really quickly thru each of the sections. This is my list for the week. It can be big pieces of a project that I need to break down or just reminders for things later in the week. It comes from the monthly page and the previous week’s work. This isn’t a calendar. This is what I’m doing that I have to do other things for. Like, Sunday at 3:30 I’m getting together with Joan…but I need to remember to bring her gift. So that little reminder is down there. One of the few apps I use for organizing is Wanderlist. It’s free and I use it for a few things. One of those is things I need to buy. Not just grocery list but, I’m looking for a white t-shirt that always looks good. When I’m out shopping (which is almost never) I have something I can say “what were those things I said I’d look for next time someone drags me to the mall?” Because, honestly, who remembers that stuff? This section is here because I don’t want to pull my phone out if I’ve managed to be offline working. I’ll add those things to the app later. Each box = a certain number of words for me. There’s two rows bc each day I work on two projects. These are where my monthly goals trickle down to my weekly projects trickle down to my daily to dos. They’re bite size most of the time. You’re not going to see “Write Book 4” on the daily list. I’m just not that fast. But, I said there were other sections, right? What follows is a group of lists. These are moving targets. Depending on what they are and when it is, they can get shifted to a month/week list to get done, or just sit out there as a nice reminder. I have one for post-conference contact/work, one for marketing ideas, one for book ideas, one for swag ideas, one for discussions with my writer lunch group, one for one-day/would-be-nice things. After that, I have a master list page for books. It lists everything I personally do to get from idea to published. I’m constantly looking at this to do it better. I just grabbed an idea from a friend and shifted it into my process this past week. Then two sections of notes. One for meetings. One for brainstorming and book stuff just for me. And that’s my life in a one-inch binder! If you’re curious about digging in deeper with organic planning, check out my workshops HERE.